We left home at 8.00 am and arrived at Fangs Brow at 9.00 am as we wanted to be sure to be able to get a parking spot. Not only did we get a spot but we had the choice of where and how to park since we were the only ones there. The weather forecast for today was good, no rain, hardly any wind and plenty of sunny spells and we left home in lovely weather. As we drove further west the cloud increased and although we were still in sunshine at Fangs Brow it was obvious that we weren’t going to have it for very much longer as the cloud continued to build up. 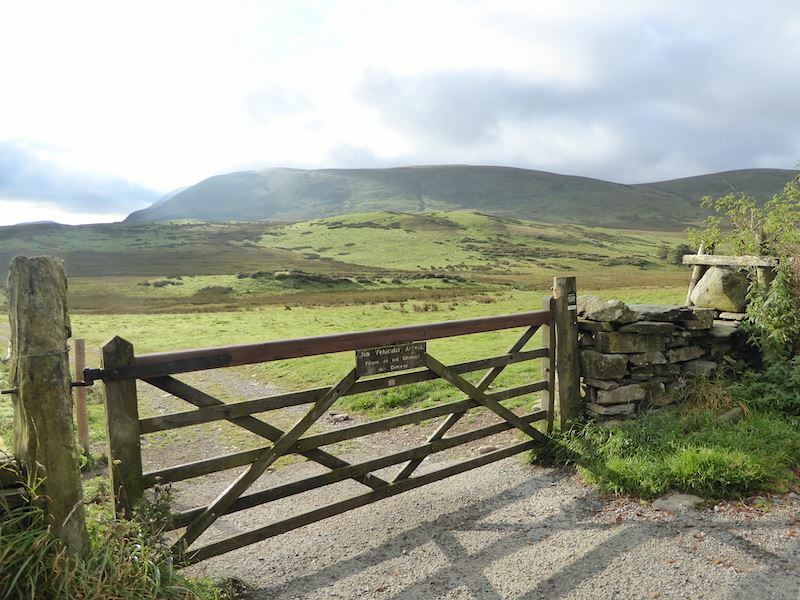 The gate at Fangs Brow which gives access to the path to Burnbank Fell, the one on the skyline. Its a lovely morning. Just as we set off the sunshine disappeared and we were under a cloud blanket. 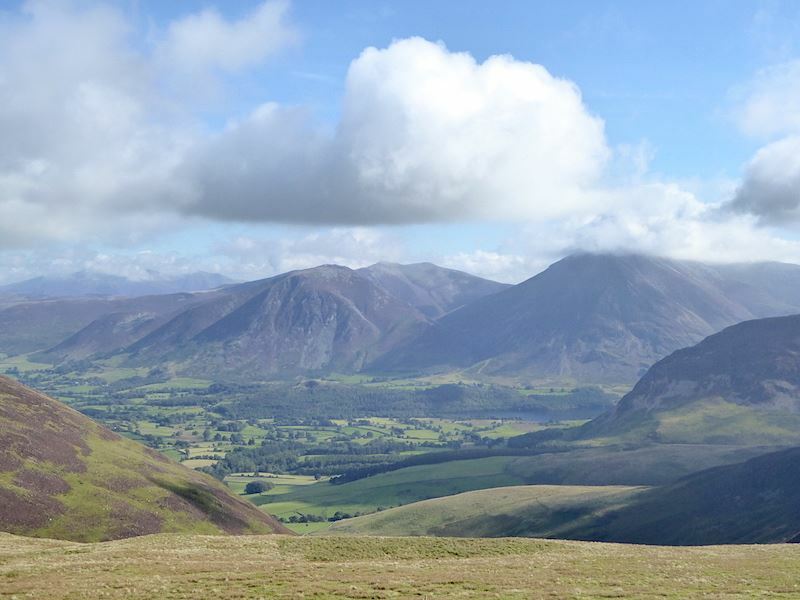 Its just clipping the top of Grasmoor in the centre of the shot. Despite the cloud it was quite a still day as we walked along the farm track alongside the wall in the direction of Burnbank Fell. Crossing the lower fields at one point was a bit of a concern since a rather large bull was standing alongside the path and watching us approach. He was on the left side of the path by the wall, the others in the herd were over on the right of the track and as we continued towards them another bull came wandering across the path too. The rest of them then began to move slowly across our path so I quickened my pace to get by them before they blocked the way completely. I had said to J not to make any noise and just to ignore them, so what did he do? Started saying ‘hello’ to them and then whistling. Despite that we managed to walk by them without any trouble. 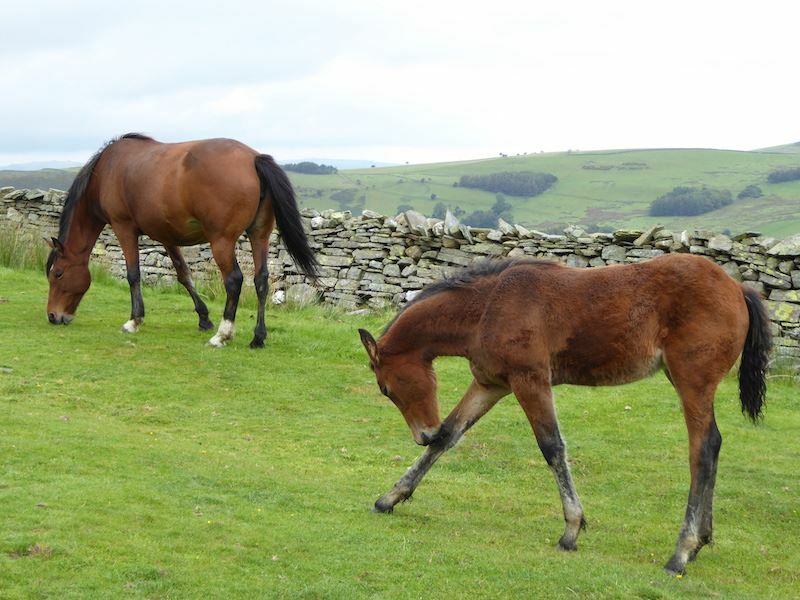 A little further on from the cows mother and foal were busy and paid absolutely no attention to us as we walked by. Over the wall we have a view of Fellbarrow. 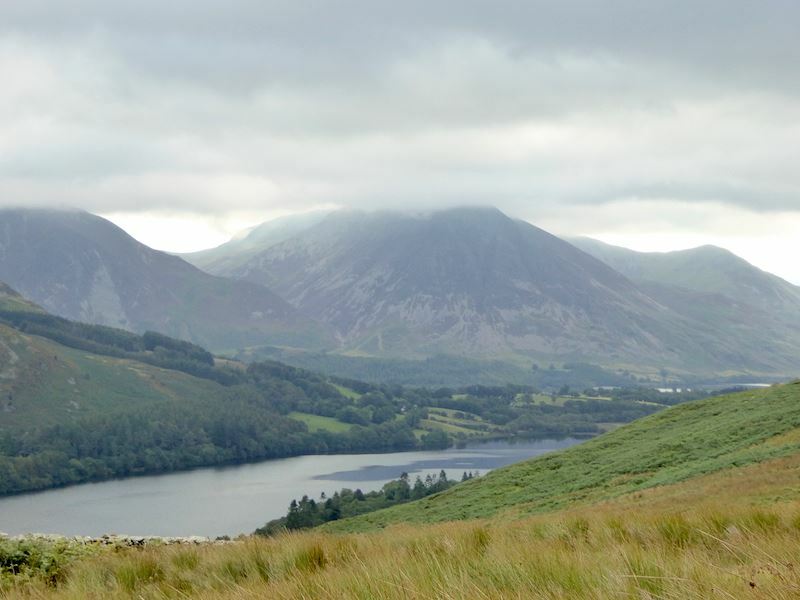 Loweswater comes into view and the cloud increases on Grasmoor. The weather was definitely getting gloomier by the minute and by now it was quite grey overhead, what happened to the lovely day the forecast had promised? 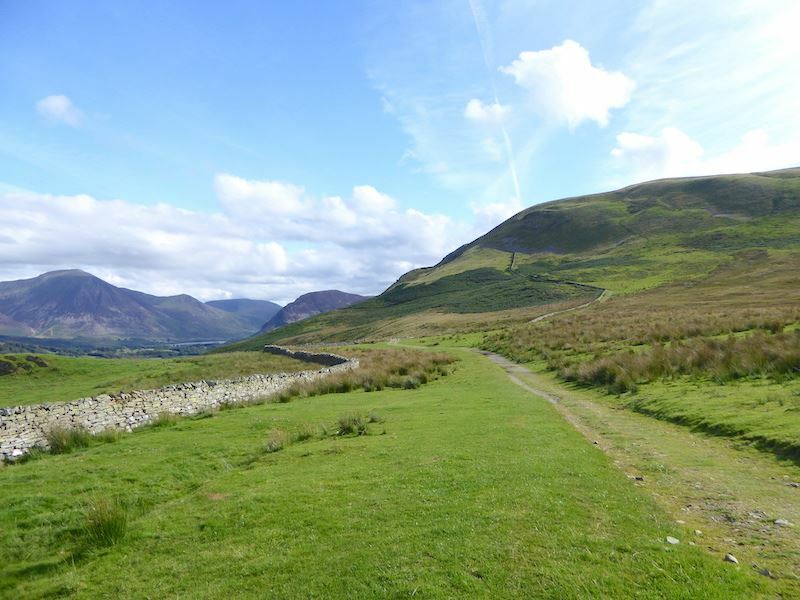 There’s a choice of routes at the gate: left for Loweswater, ahead for a steep ascent of the slope on the left skyline, or right for a slightly more manageable zig-zag path up to the marker cairn. 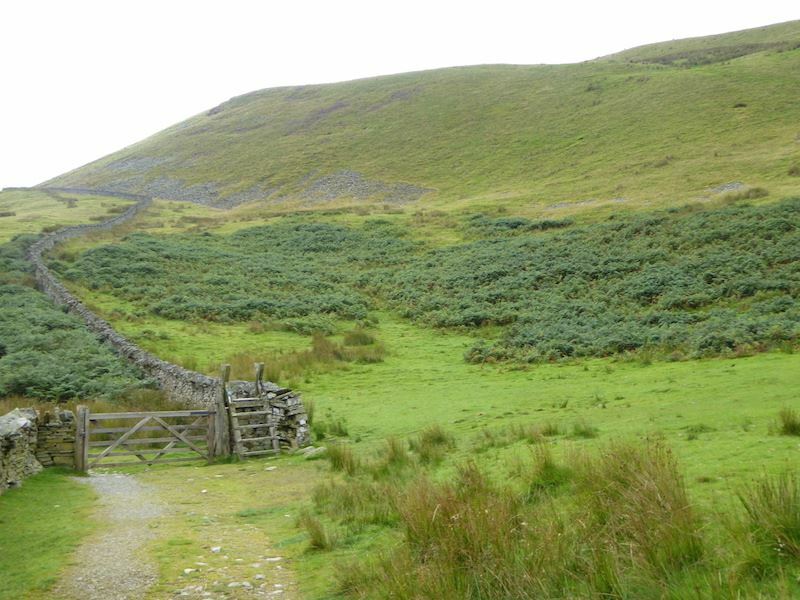 There’s the gate in the bottom left, we chose the zig-zag option for our route up Burnbank Fell. The path climbs in a zig-zag so its supposed to make it a bit gentler, but steep is still steep whichever path you take. It looks much worse than it really was though and the ‘steps’ came in handy. Plenty of stops for photos and a rest for the legs helped too. 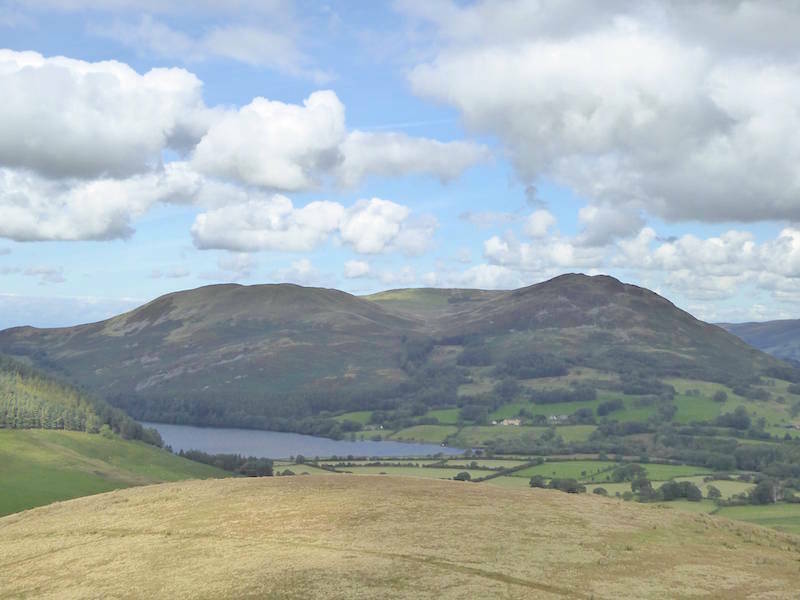 The view across Loweswater as we reach a flatter section. 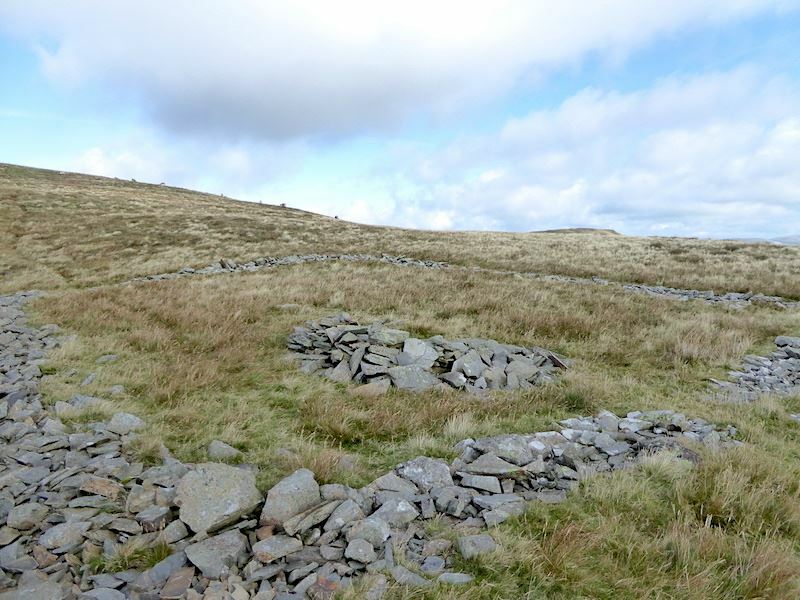 Its not the summit of Burnbank Fell, just a marker cairn or ‘pile of stones’ as its described on the OS map. 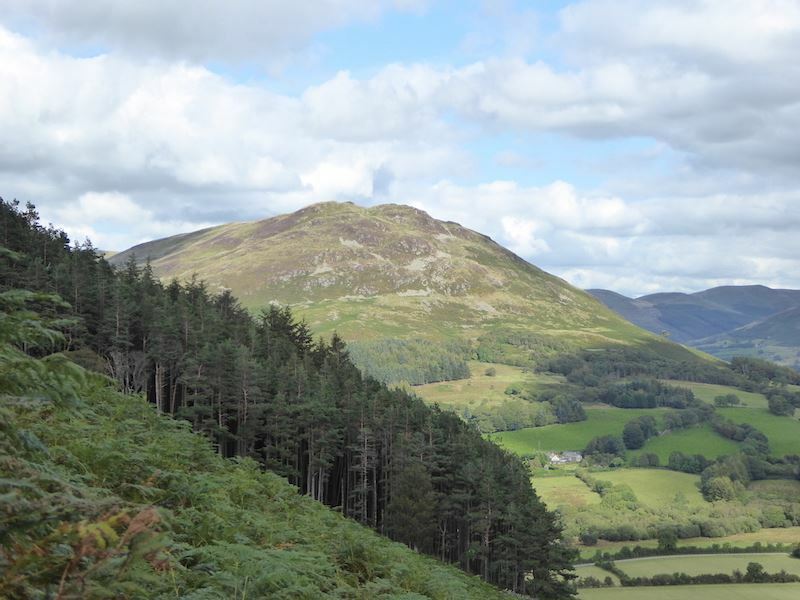 A view of Carling Knott as we continue the climb up to Burnbank Fell summit. The route ahead, but here comes the cloud and within seconds we had lost all views. Time for the jackets to go on. Burnbank summit. The cairn is about 2 yards over to the right but two walkers were sitting on it or we might have clambered over. The fence is a useful guide in such conditions. It was a while before the camera came out again since views were non-existent. 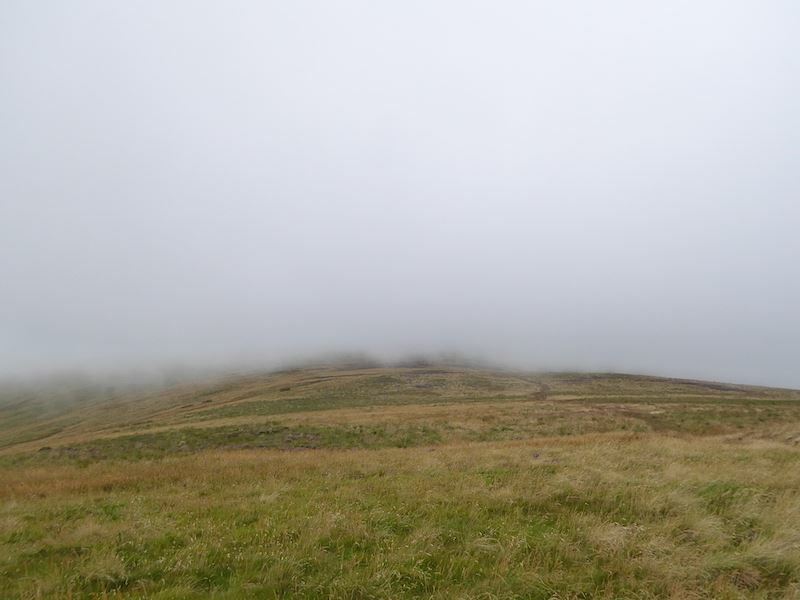 We carried on through the murk and a couple of minutes later the two blokes who had been sitting on the cairn came charging past us as if they had a train to catch. 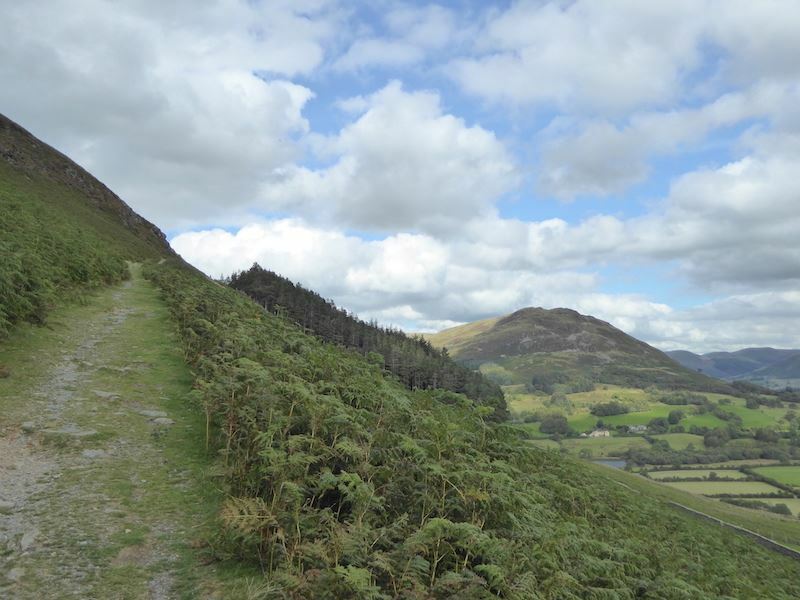 The cloud eventually thinned and drifted away, and now we can see where we’re going, along a very soggy path up there to Blake Fell. The two blokes were up ahead with one of them now struggling in the boggy conditions and beginning to fall behind the other one. They were following the track to Blake Fell too so it crossed my mind that the lead bloke was anxious to bag the summit shelter. There seemed to be no other reason for all the rush, unless he was ultra competitive and wanted the dubious satisfaction of getting in front of us. 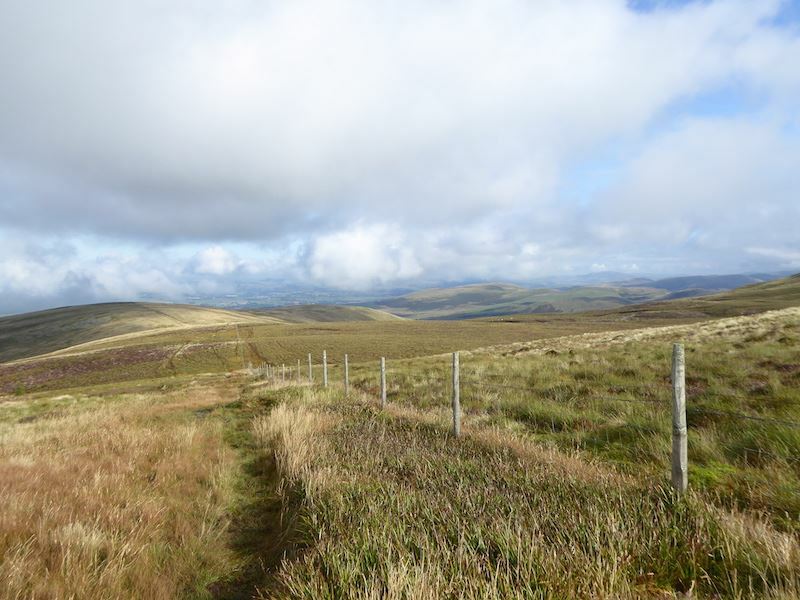 If that was the case he needn’t have bothered, we don’t approach our walks as if they are fell races and we certainly don’t compete with other walkers to get somewhere first. Can’t see the point myself, there will always be somebody behind or in front of you so why rush about unnecessarily. 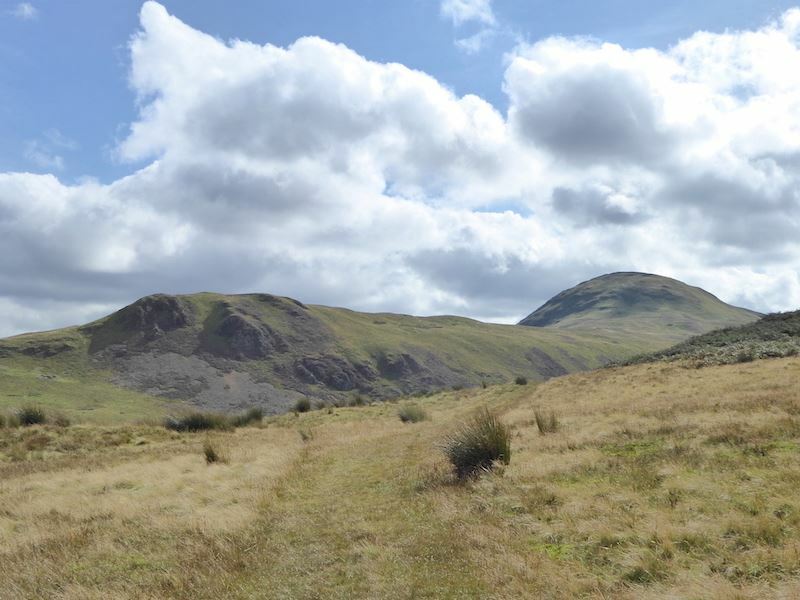 Looking back along our route from Burnbank Fell. The cloud is breaking up nicely so we may be in for a nice day after all. As the ground started to rise higher we left the sogginess behind, the cloud was thinning out rapidly and moving away from us and the sun was beginning to break through, all of which lifted the spirits no end. The warmth came back, the views came back and we could now see where we were going so things were much better all round. 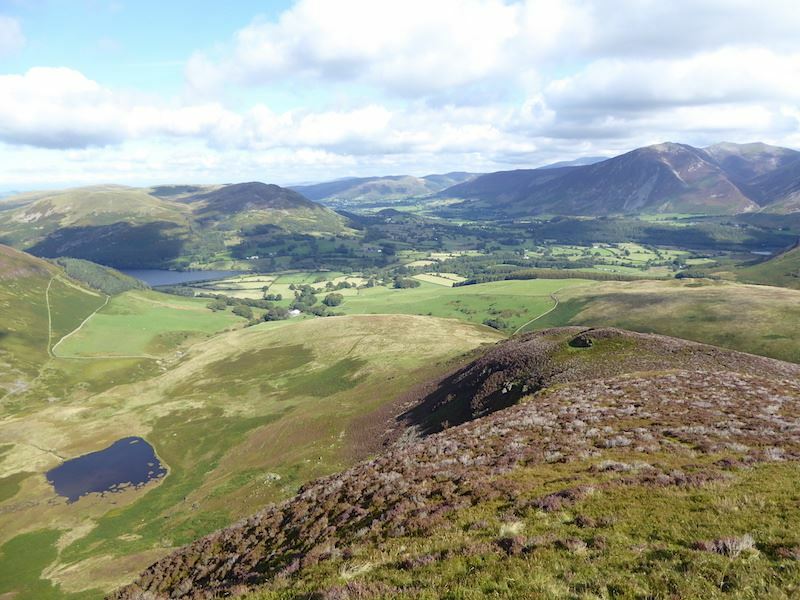 From Blake Fell summit there’s a view of Cogra Moss, the watery bit, and Knock Murton is the hill to the left of it. 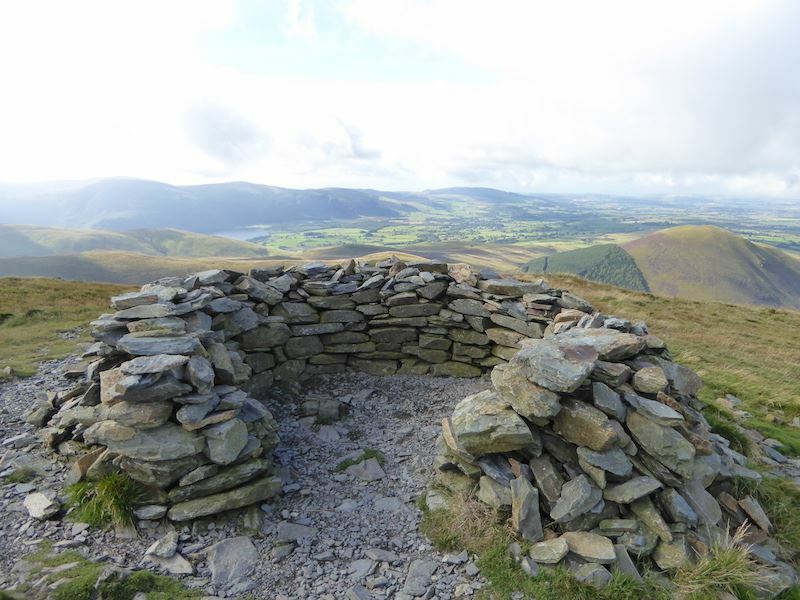 As I suspected the two blokes who had charged ahead of us were in the summit shelter as we got nearer to it, not that it would have done them a lot of good as it is perfectly useless as a shelter unless you are a very short person. The top of the shelter is only just above knee high and is very small inside so not a lot of room for two big blokes. They were only about ten minutes in front of us so they didn’t stay in it very long and as we approached I noticed them preparing to leave. Off they went so we sat against the shelter wall and had a short break while J tucked into his Mars Bar. 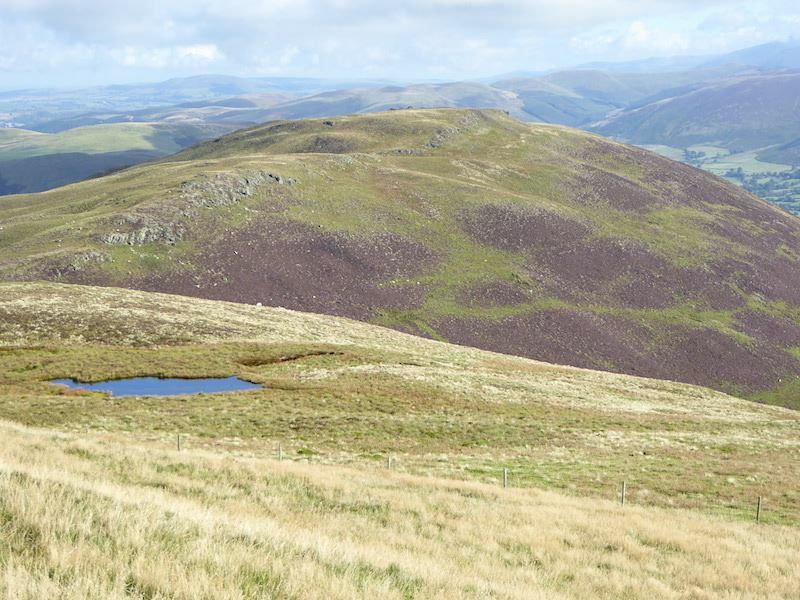 Carling Knott across a little tarn just below Blake Fell summit. 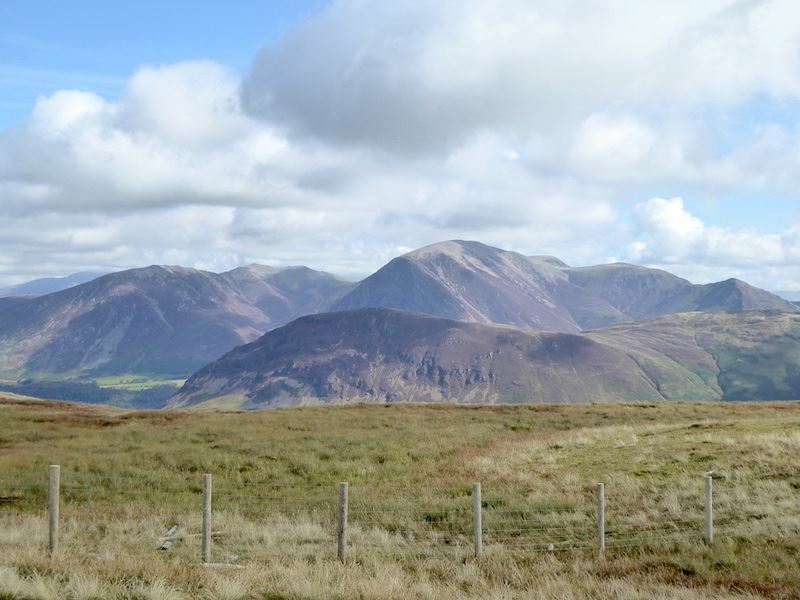 Looking across Lorton Vale to Whiteside and Grasmoor. Its turning out nice again. Its still looking a bit murky over there though. 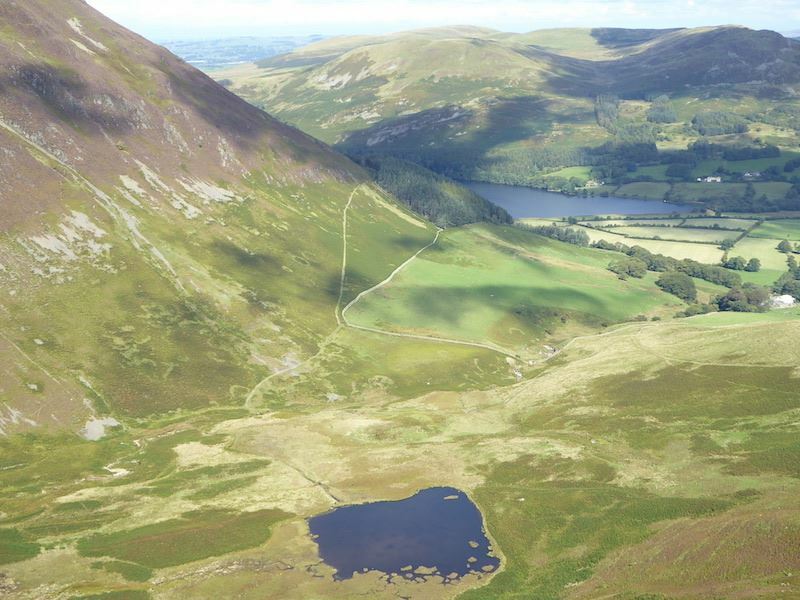 Buttermere is in the centre with Fleetwith Pike rising right behind it. 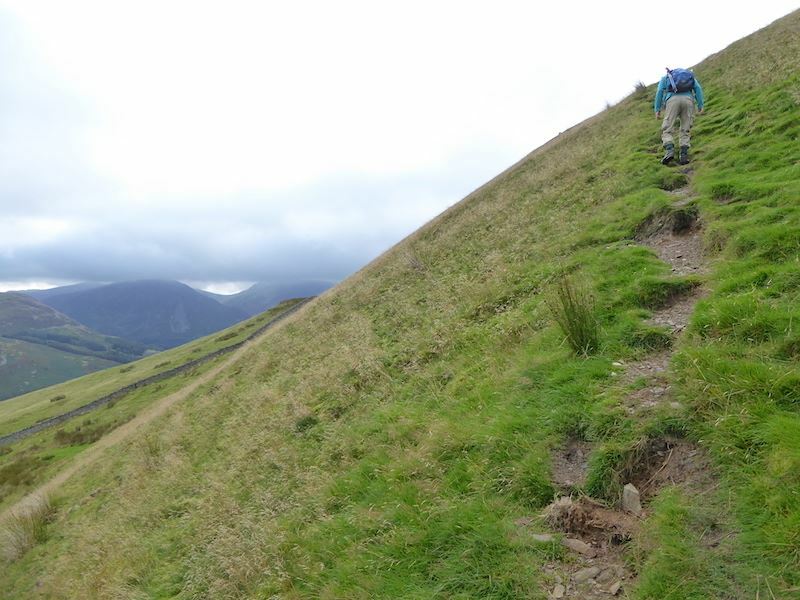 On the descent from Blake Fell and heading towards Gavel Pike. That’s the one in shade in the middle foreground, you just follow the fence. As we left the shelter another walker came towards us, another bloke, a thirty something, with lots of studs all over his ears. He couldn’t wait to tell us that he’d been on Mellbreak at 7.00 am that morning. Were we supposed to be impressed, give him a medal, pat him on the back or what. Why did he think we would be interested in what he was doing at 7.00 am? We couldn’t have cared less. I noticed another walker approaching from the same direction so I asked ‘ear studs’ if it was his walking companion. Turned out that it wasn’t and that he ‘walks alone’ due apparently to the fact that his mates say he walks too far. Well that may be, but he was the sort of bloke who would get on your nerves if you were out for the day with him so perhaps that might be the reason they wouldn’t walk with him. I wouldn’t want to walk to the garden gate with him. 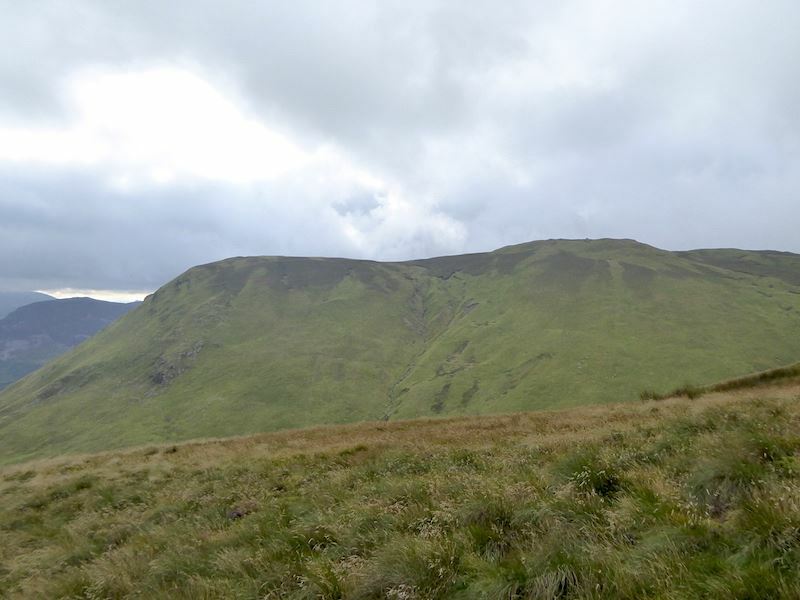 Off we went, leaving him and the other guy to sort out who was going to bag the shelter, and started descending to make our way to the crossing point for the path to Gavel Fell. Several people were on their way up as we went down but only hellos were exchanged and nobody trying to tell us their exploits thus far, thank goodness. Further down the path was this arrangement of stones and I have no idea what it is. There’s nothing at all marked on the OS map. It was a fair size whatever it once was. 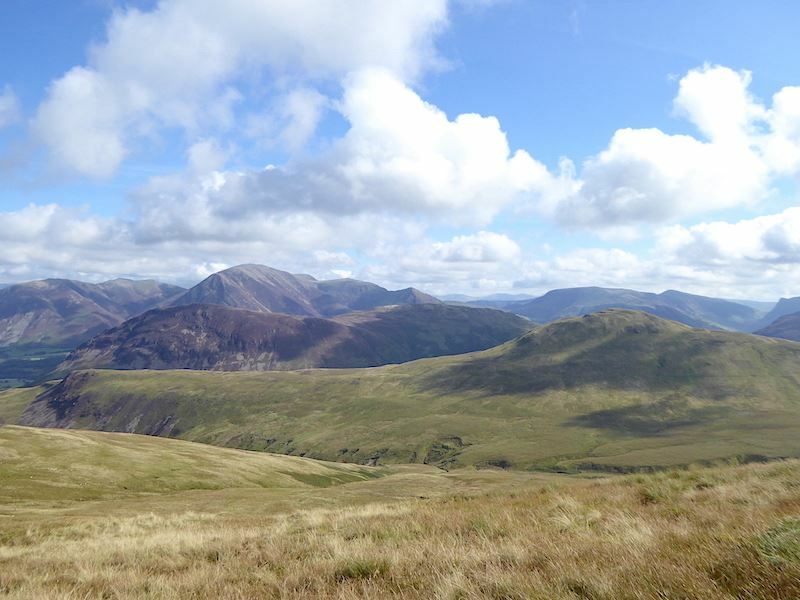 Red Pike on the centre skyline with Starling Dodd on the extreme right. 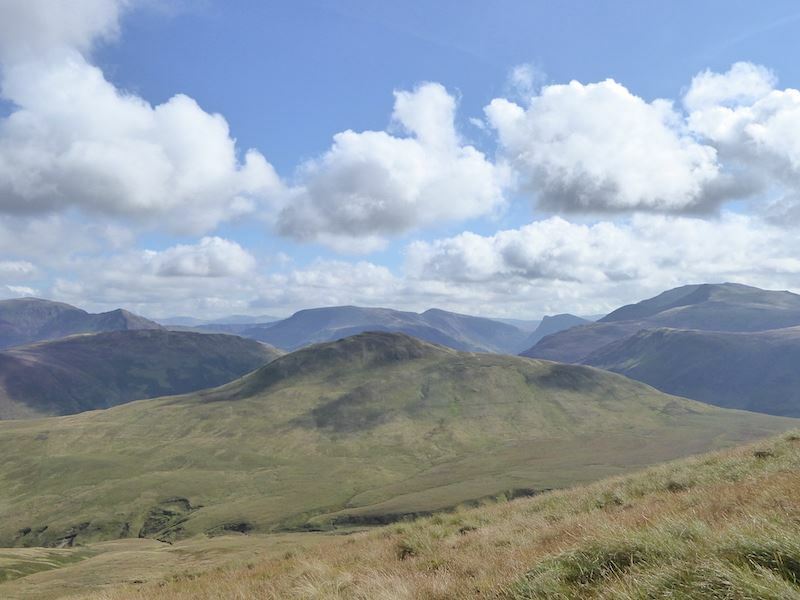 A look back at Blake Fell as we make our way over to Gavel Pike. As we reached the corner fence back there and crossed over it we met a couple who were just about to cross it on their way up to Blake Fell. 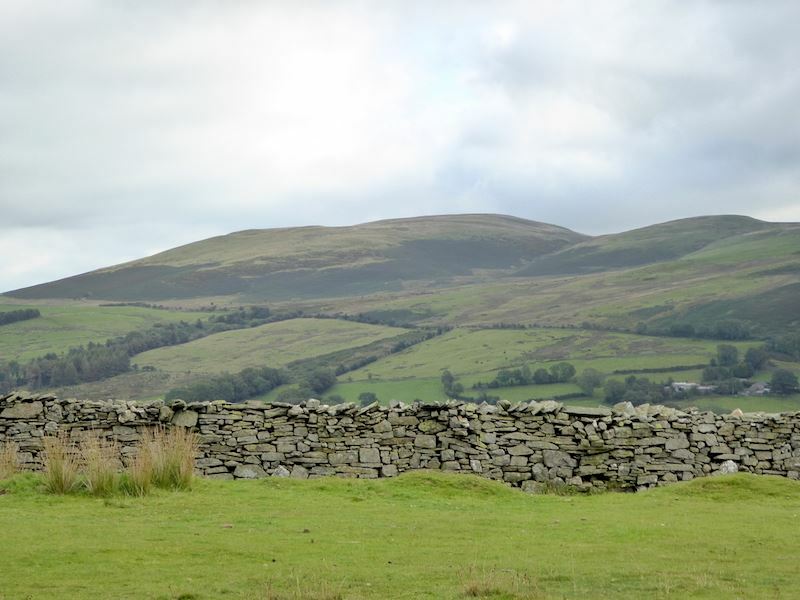 They had strong Irish accents and the woman of the two stopped and asked us if the fell in front was in fact Blake Fell so we assured them it was. Then she looked back at where she and her husband had come from and asked us what the fell behind them was. Gavel Fell we told her, that’s where we’re heading. No, she said, that’s Gavel Fell over there, pointing to an area of raised ground about halfway along the plateau of Gavel Fell, that’s where we’ve just come from. 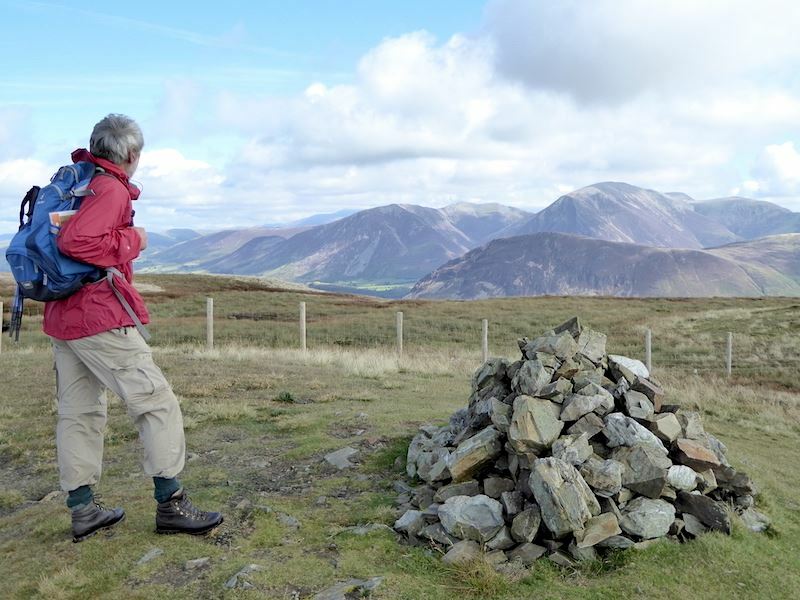 Thinking she might be referring to the rising ground just in front of Gavel Fell summit I told her it was Fothergill Head and started to get my map out. No, don’t bother, she said, we have a map so we’ll have a look at it later on. With that we went our respective ways while we mulled over what she had been on about. Gavel Fell was directly in front of us, but that wasn’t what she had pointed at so what I think they had done was get confused. 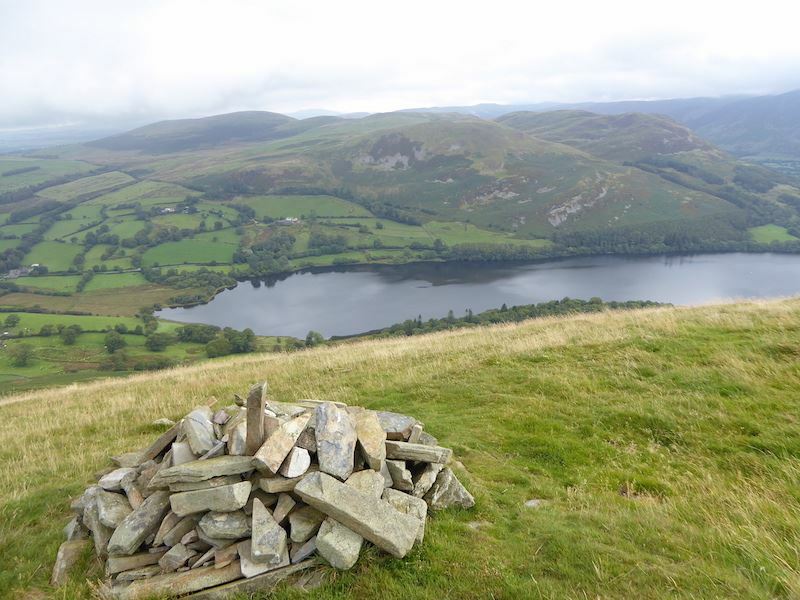 If you take the path from Loweswater, which they had, and climb up Gavel Fell’s north ridge and up on to its plateau the path will lead you to a marker cairn on High Nook Top. From there the path continues to the fence line just below the summit of Gavel Fell. 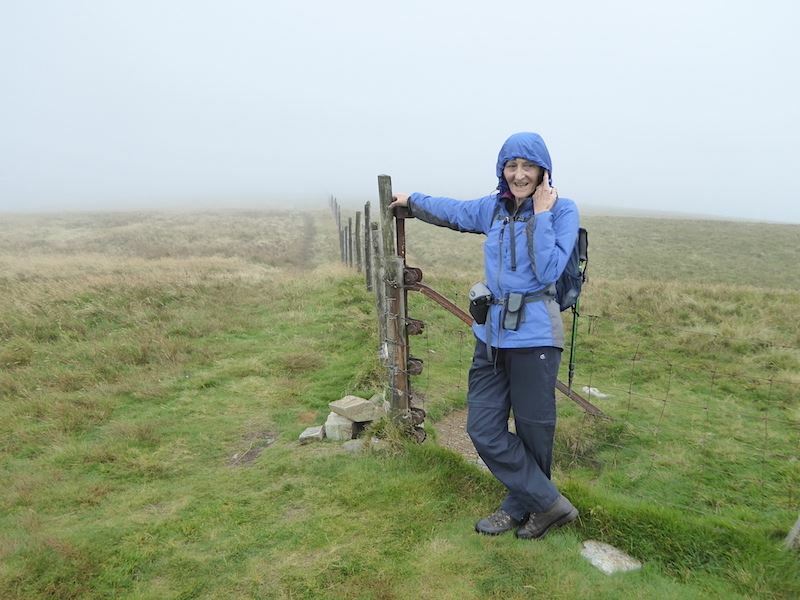 Here there is a stile in the fence and once across the stile you would need to turn up to the left to reach the summit of Gavel Fell. 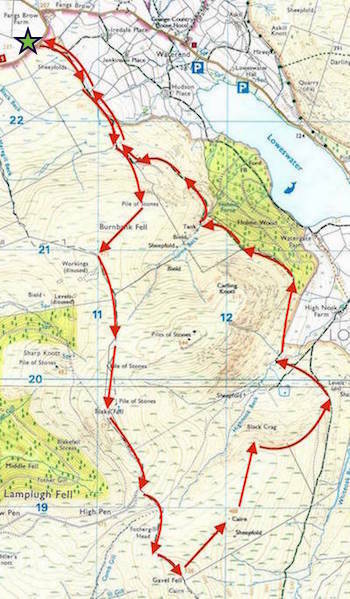 Taking a right turn over the stile takes you over to the Blake Fell path which is where we had met them. 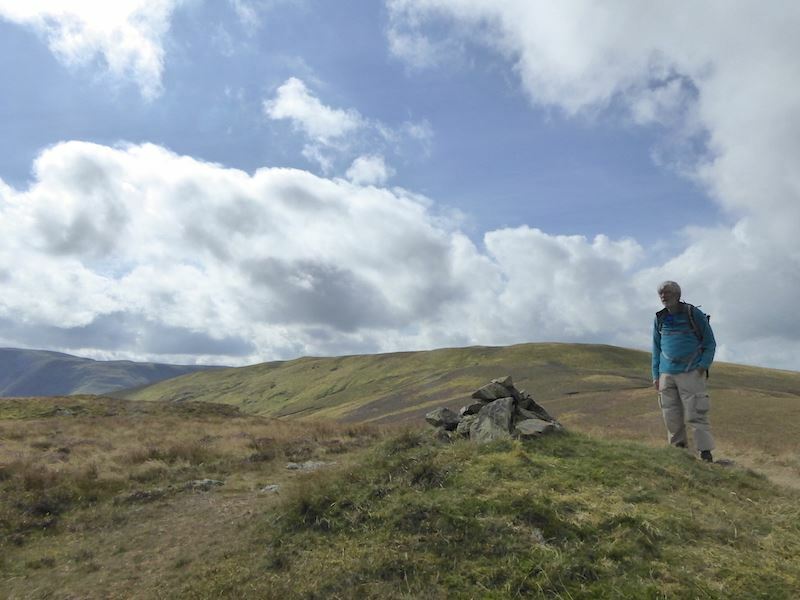 My guess is that having reached the marker cairn they thought they had reached the summit of Gavel Fell when they really hadn’t, and then by turning right at the stile they missed the summit cairn on Gavel Fell altogether. That explains why they didn’t know what the big hill behind them was, its Gavel Fell and I’m sure they’ve missed the summit of it. A quick look at the map they were carrying would have told them where they were, I wonder if they did eventually look at it and realise what had happened. 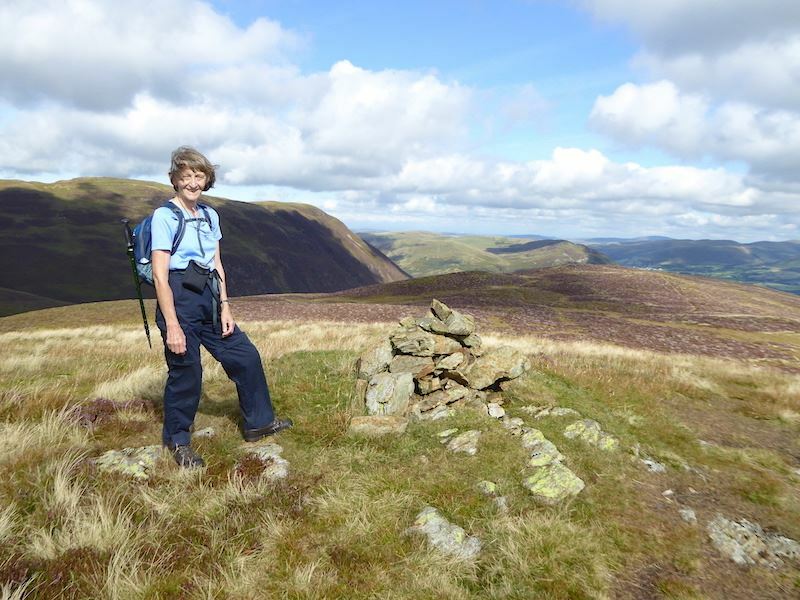 You have some interesting experiences out on the fells. 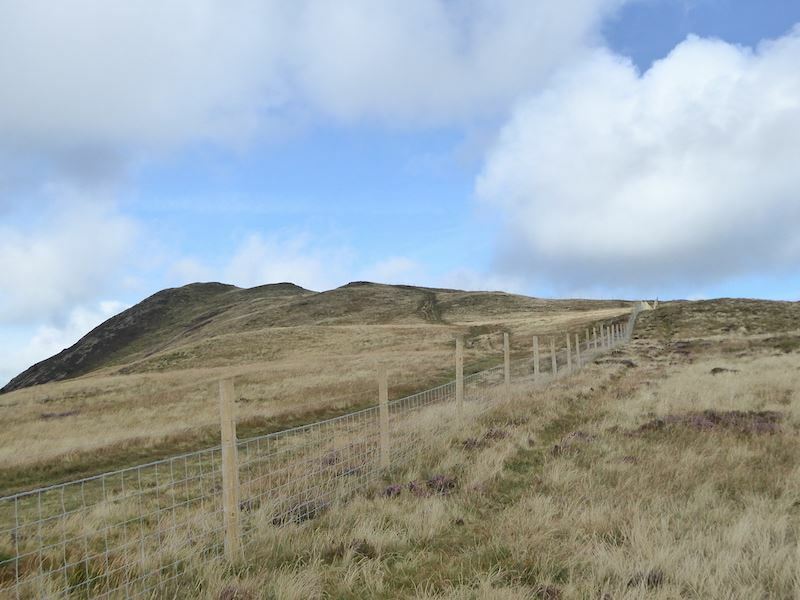 We were still mulling over the conversation with the Irish walkers as we continued on up to Gavel Fell top, noting the new fence which we had seen a chap erecting in June last year and which was now finished. 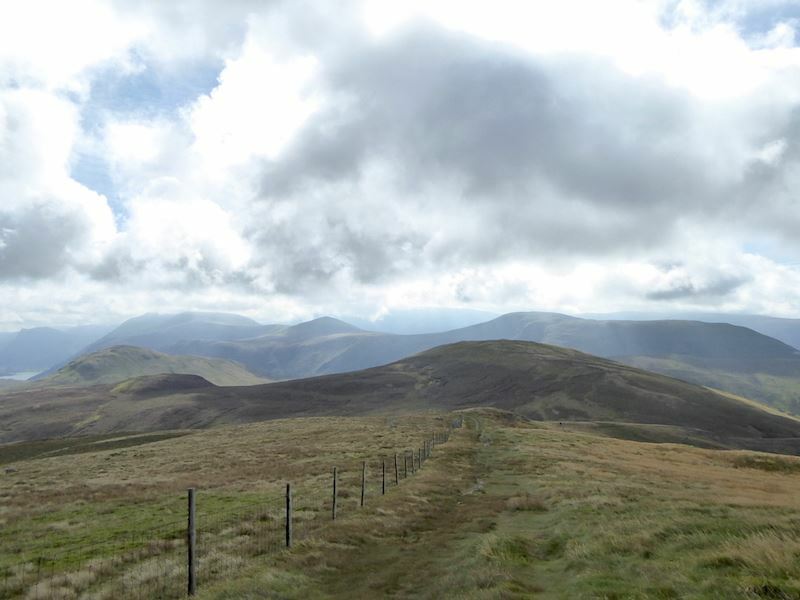 From the climb to Gavel Fell a look back at Blake Fell on the left and Carling Knott on the right. 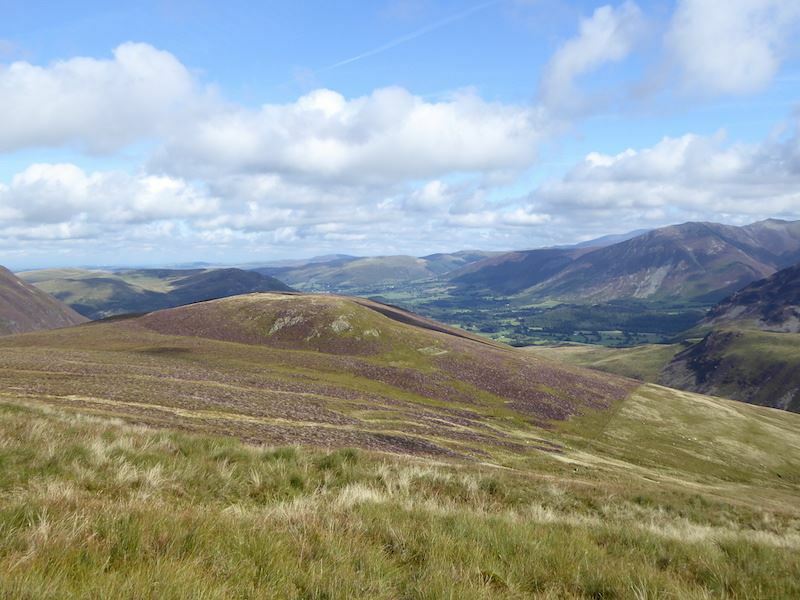 Across acres of purple heather, now in full bloom and scenting the air, are Grasmoor, Wandope and Whiteless Pike. 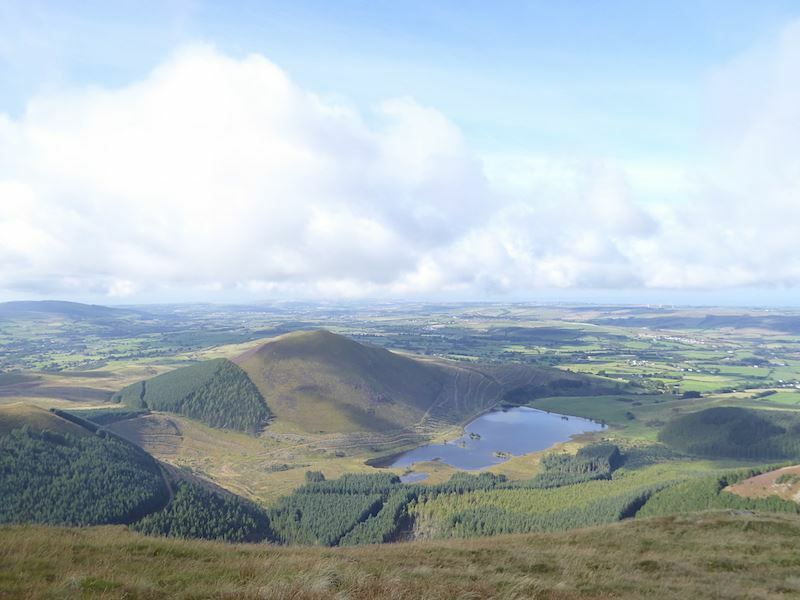 The ridge along the middle of the photo is the top of Mellbreak. Gavel Fell summit. The visibility to the middle distance was OK, but anything further away was too indistinct to see. I didn’t mind, clarity means a cold north wind is present and as we had a very gentle westerly I was happy to do without the long distance views for today. 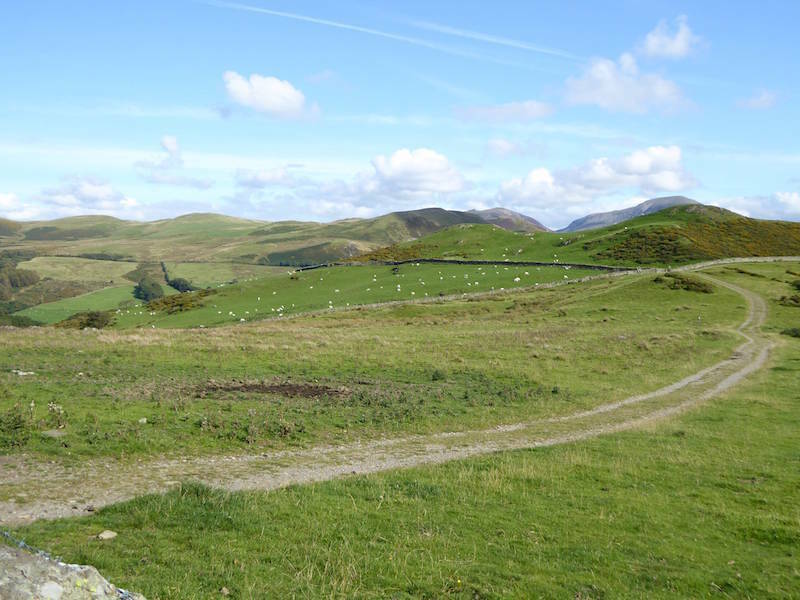 We can see more of Mellbreak now, in the middle, and a whole lot more of the fells behind it too. When we came up here last summer one man, working by himself, was replacing the old fence. Its looking a lot better over there now all the cloud has lifted from the tops. He made a good job of the fence didn’t he? 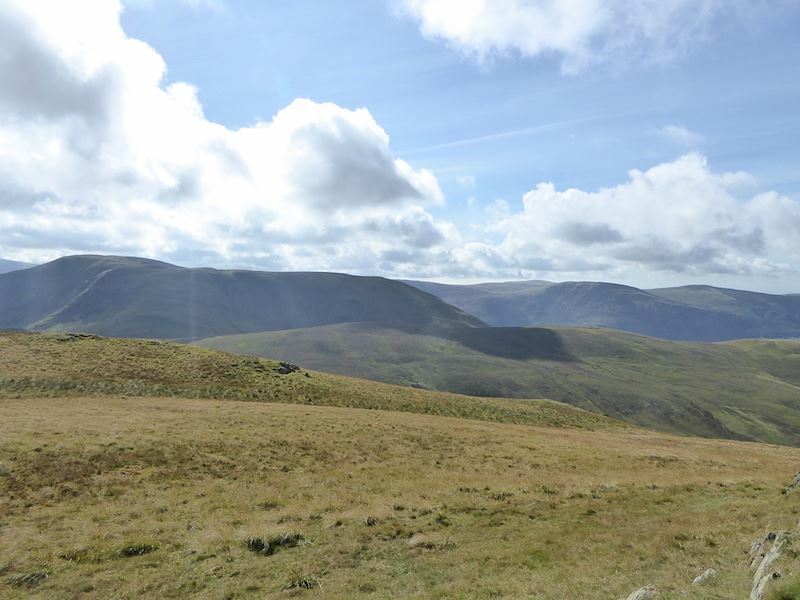 From Gavel Fell summit looking across to Great Borne on the left, and its ridge running over to Herdus. 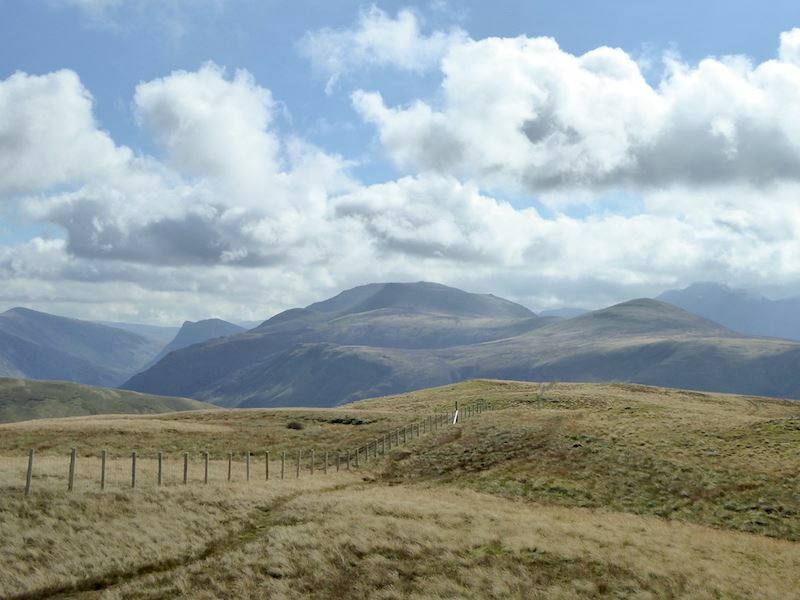 Over on the right of the skyline are Crag Fell and Grike. 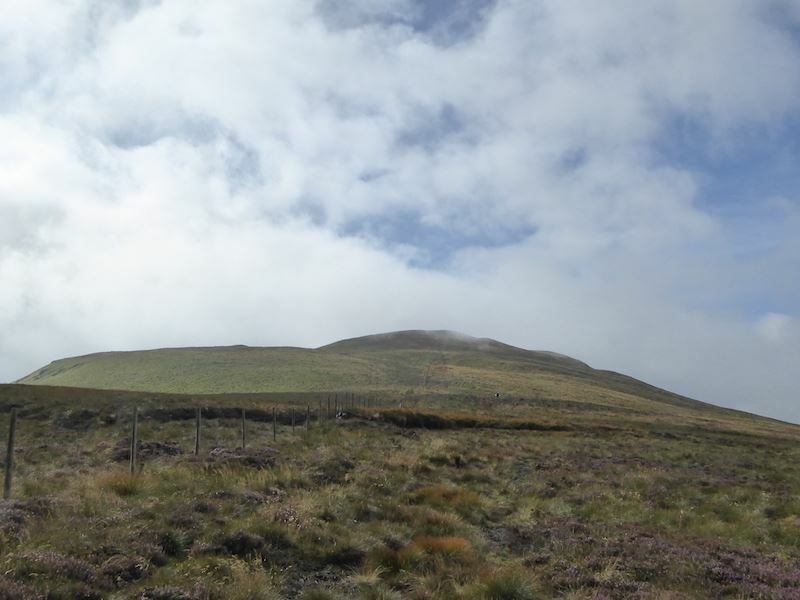 From the summit we headed across the plateau to the marker cairn on High Nook Top, the place which I think the Irish woman thought was Gavel Fell summit. 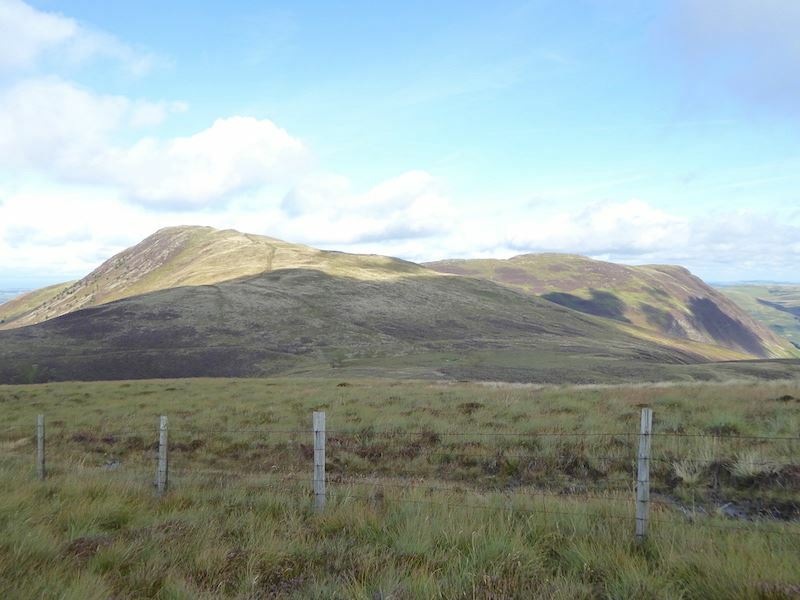 The cairn is situated beyond that rise in the centre, with a square sheepfold just to the right of the rise. Visibility is really good now, here we can see Hen Comb nearest to us, behind is Mellbreak with Grasmoor and its surrounding fells beyond that. Its just past midday, the sun is out, the sky is blue, there’s plenty of cloud but its not spoiling the view. I’m now down to t-shirt level as it was very warm walking across here with the sun on our backs. As you can see there’s a slight breeze which was very welcome at times. 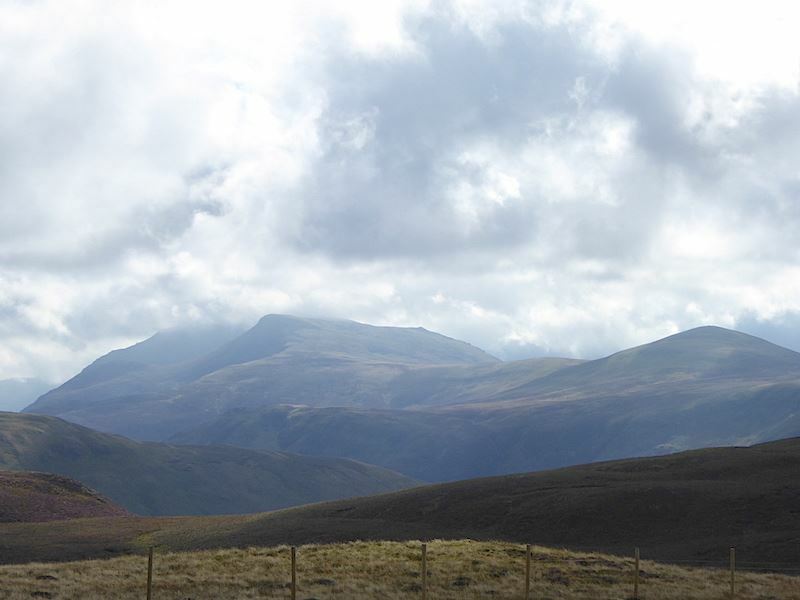 From the little cairn on the small rise a look back at Gavel Fell on the skyline. 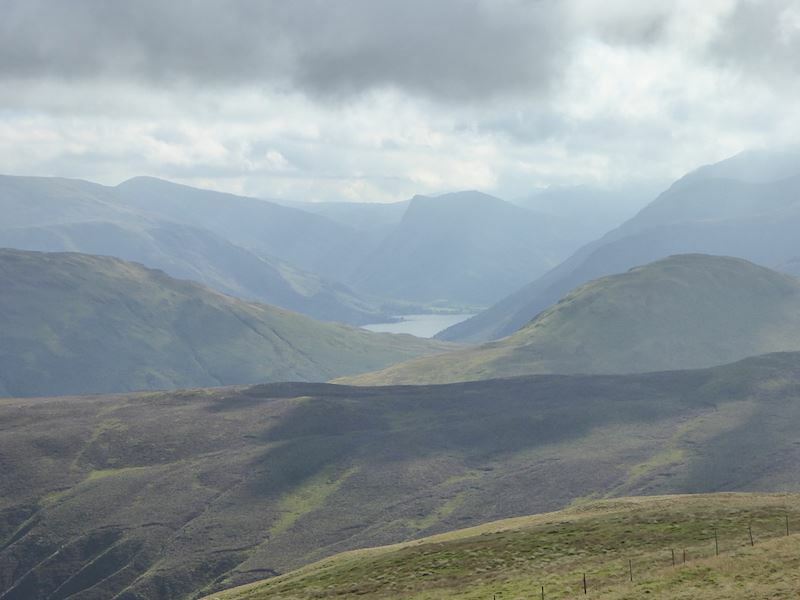 A glimpse of Buttermere over to our right as we continue our descent through the sweet smelling heather. 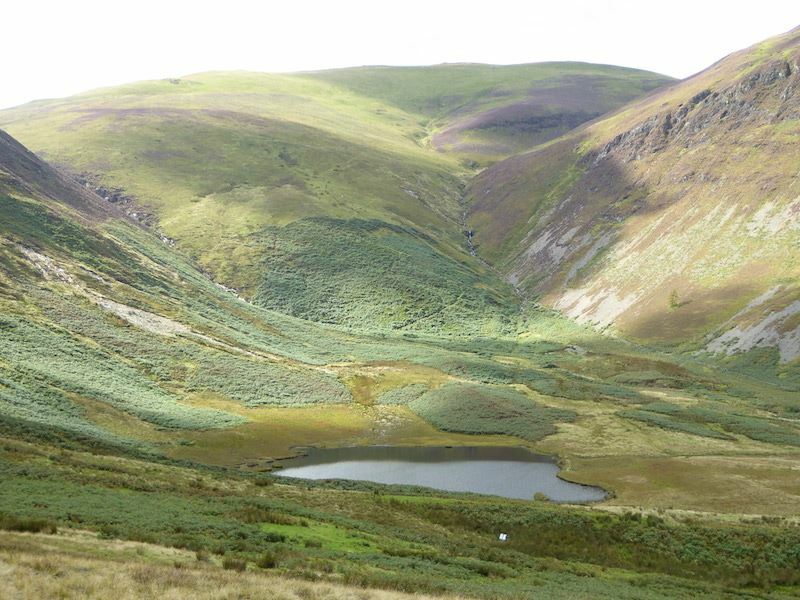 The plateau ends above Black Crag from where we can look down at High Nook Tarn. The path beyond, which is rising up the hillside, is what we are aiming for. High Nook Tarn on our left as we head down the ridge to find a place to have some lunch. Its now 1.00 pm and a long time since breakfast so we were getting ready for a stop and something to eat. 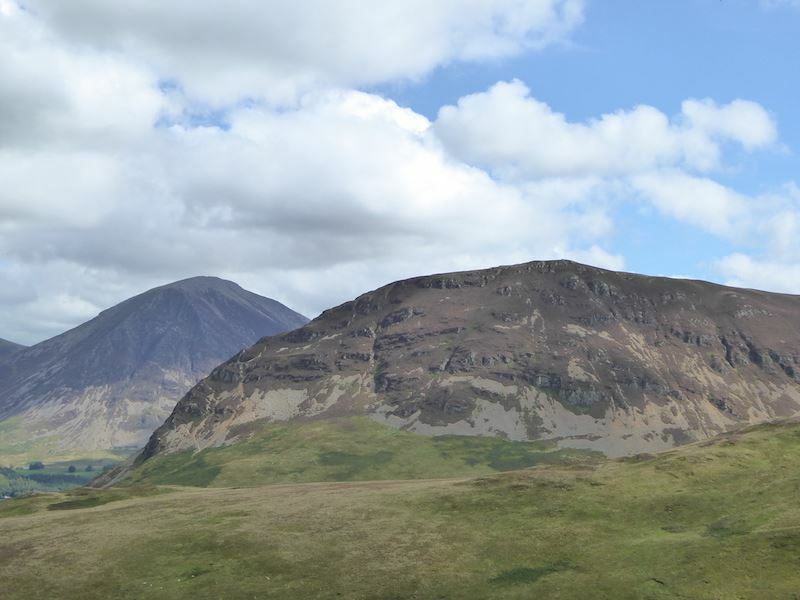 From our sunny lunch spot we have a view of Mellbreak with Grasmoor just behind it. We watched a pack of trail hounds chasing about the lower slopes just below us, running at full pelt and barking their heads off as they picked up the scent of the aniseed trail which had been laid down for them. We kept hearing them for the rest of the afternoon so they were having a good run out, how they can keep that running up without ever stopping always amazes me. Directly in front of us are Darling Fell on the left and Low Fell on the right. What a great place to eat your sandwiches. We had a good thirty minutes stop for lunch just enjoying the break and the views but we had to get up and continue eventually. As we descended I took a look back for this shot of Hen Comb. Down there is High Nook Tarn. Beyond it can be seen a path through the bracken which is another route up to Gavel Fell. 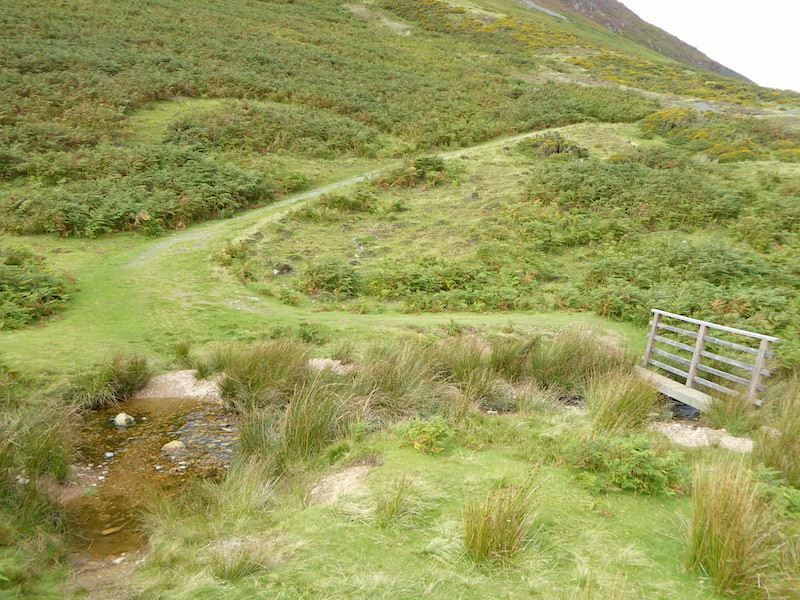 Crossing High Nook Beck to take the path along the fell side. From the path a look over to Low Fell which has been in the shade for as long as it has been in view. Patience is needed, the sun will eventually hit on it. 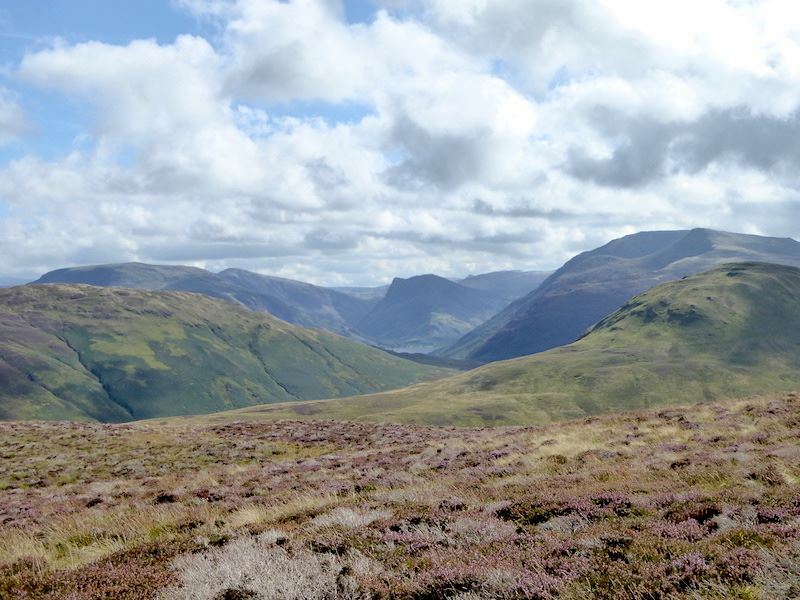 Patience rewarded, at last the sun shines on Low Fell. 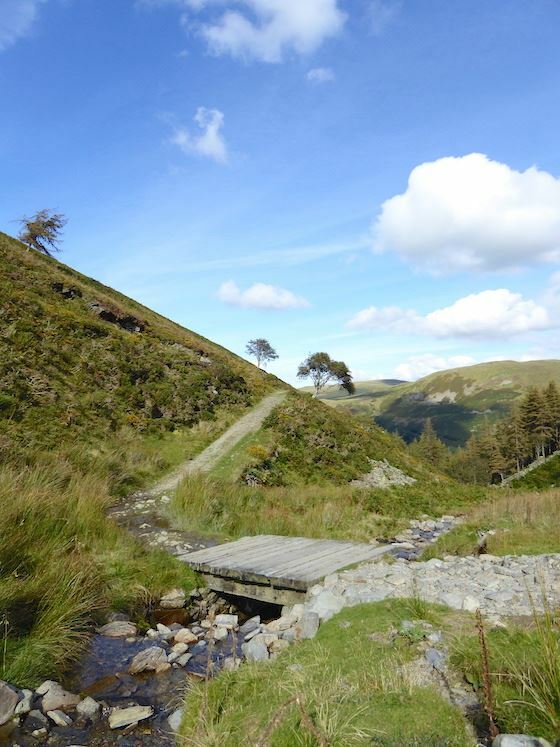 A sturdy bridge across Holme Beck. 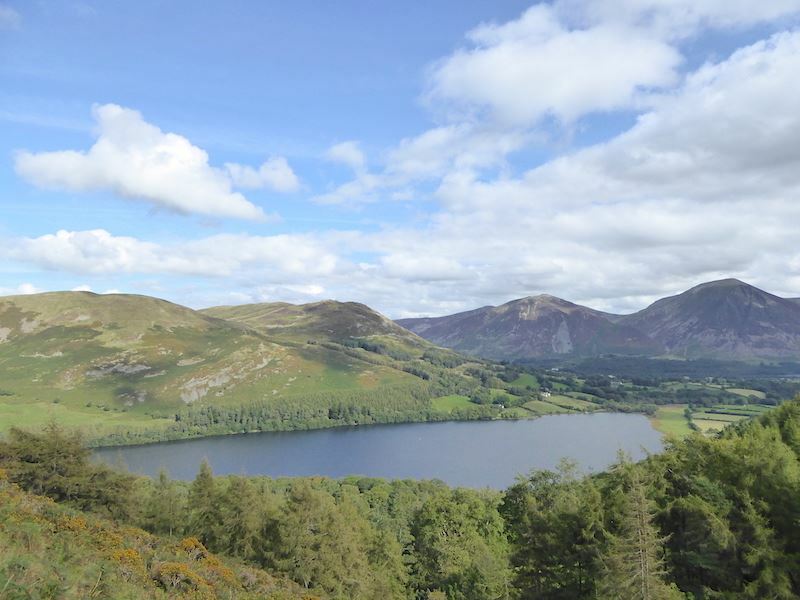 We’re now on the path above Holme Wood which gives a lovely view across Loweswater. 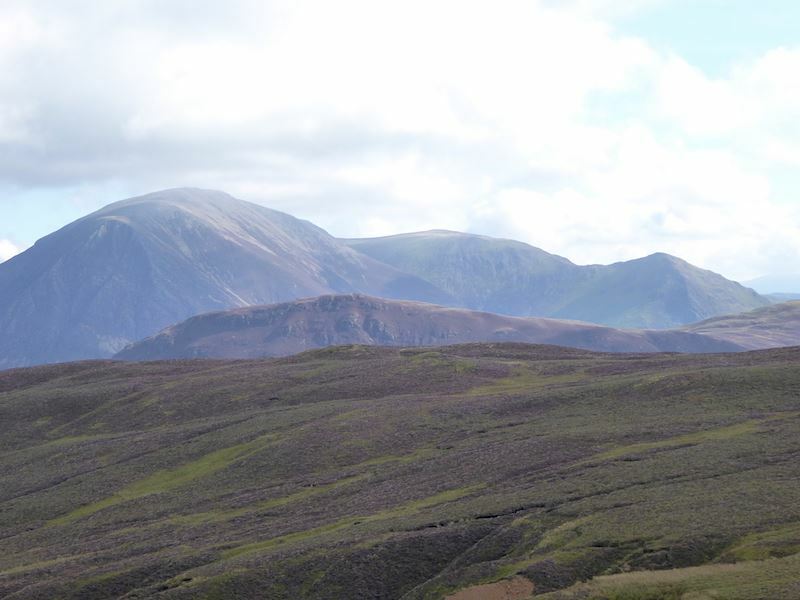 On the left are Darling Fell and Low Fell, with Whiteside and Grasmoor over on the right. The walk along the terrace path is lovely and by now the day was completely different to the cloudy conditions we had when we started out. Blue skies, high white cloud and plenty of sunshine and we met quite a number of people who were taking advantage of the fine weather to walk along it. Now that’s a seat with a view. 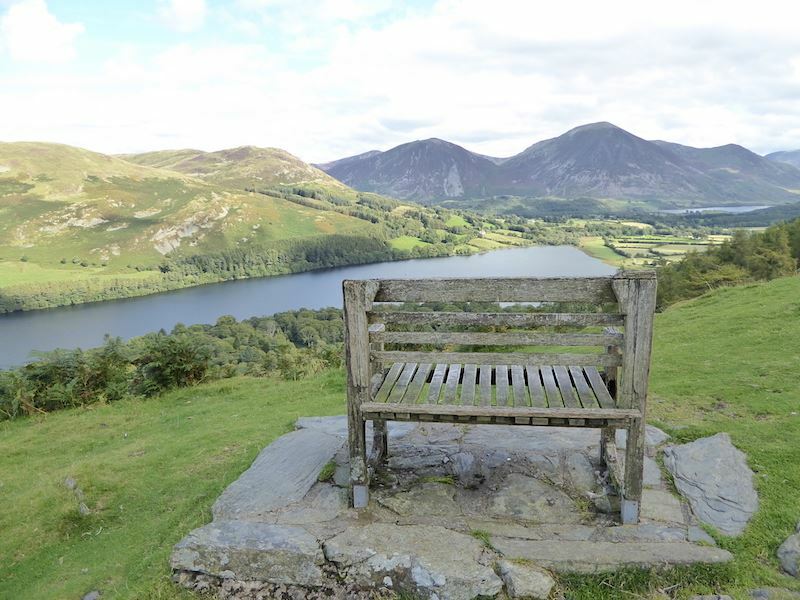 We spent a few minutes here, its a lovely viewpoint along the terrace with a bench for the leg weary to take advantage of for a while and enjoy the view along Loweswater and the Grasmoor fells at the end of it. 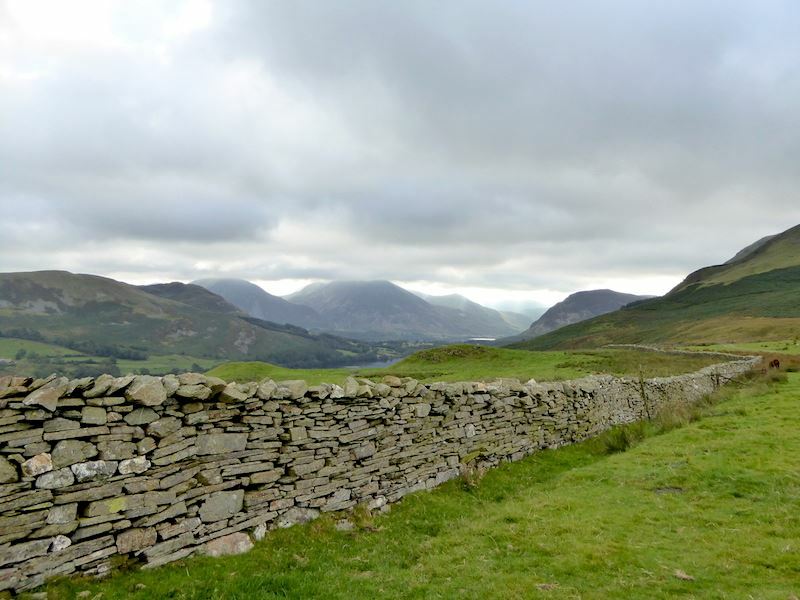 You might remember that a few years ago there was a vote for ‘Britain’s Favourite View’ and the winner was a view of Wastwater and its surrounding fells. 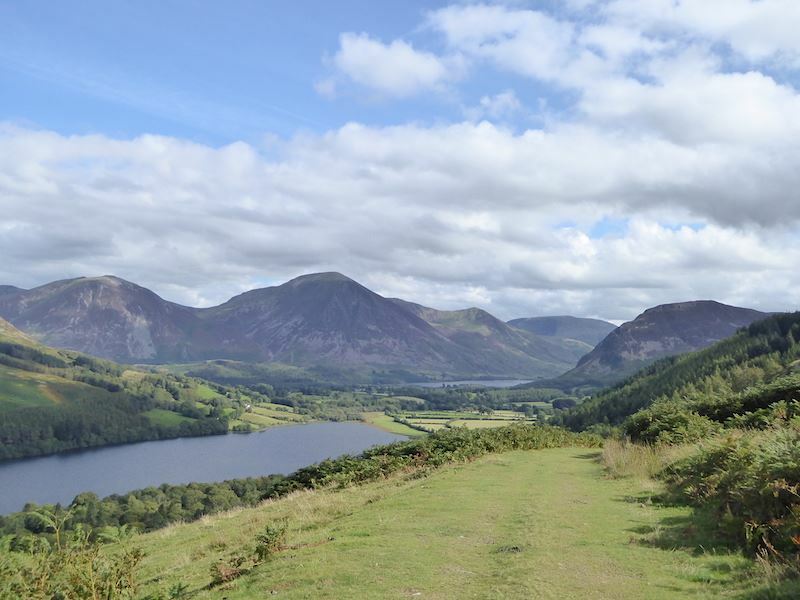 I think that if this view had been included in the voting it might just have given Wastwater a run for its money. It was just beautiful here today in the warm autumn sunshine. However, all good things come to an end so we continued along the path and in no time we were back on the farm track again. The cattle had been moved over to another field so no more apprehension concerning them, the horses too had gone elsewhere, and as we looked towards the gate at the parking area we counted 14 vehicles now parked there, just as well we turned up early then. 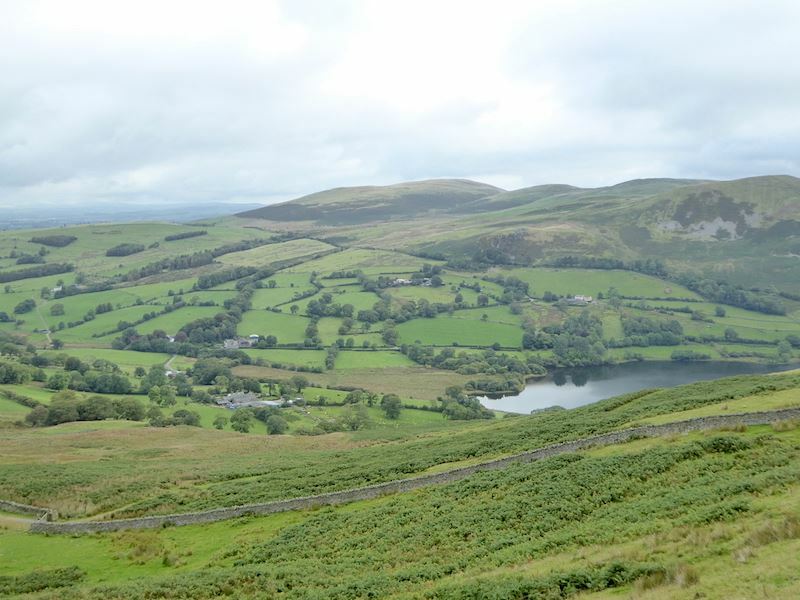 We’re back at Fangs Brow and a look back at where we began our walk this morning. We were the only people parked here when we set off, now the roadside is full of parked cars,. Where are they all?